Located in the tropical paradise of Phuket’s Western coast, Le Méridien Phuket Beach Resort is set amidst 40 acres of lush foliage, sprawling golden sands, and the emerald Andaman Sea. A mining centre during the 16th century, Phuket employed many Hakka Chinese miners, and China’s rich cultural influence can still be seen on the island today as well as the colourful influences of Portuguese explorers. The hotel features six meeting rooms, two lagoon-size swimming pools, four tennis courts, a pair of air-conditioned squash courts, a world-class spa, and a variety of land and water sports facilities along the resort's secluded beach. The hotel’s 10 restaurants and bars allow for a gastronomic journey around the globe. The resort is just minutes away from some of the celebrated sites of Phuket, including the lively shopping and restaurant district of Patong, the 29 ornate temples that dot the island, hiking trails through ancient limestone caverns, and scuba diving through the Andaman Sea’s translucent indigo waters. 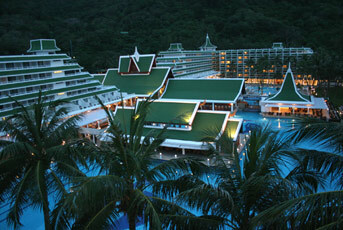 Le Méridien Phuket Beach Resort offers a truly unique experience in every one of our stylish 470 guest rooms and suites. The architecture captures all the charm and elegance of traditional Thai design, while blending naturally and harmoniously into its lush tropical landscape. Wake up every day with a romantic sunrise backdrop and watch a warm sunset with your loved ones from your personal balcony that offers view of the lush garden, the Andaman Sea, or the large lagoon-shaped swimming pool. The 37-square metre Superior Rooms offer an en-suite bathroom with a shower over bath and full toiletries. Private balconies provide views of the resort’s landscaped tropical gardens or the large lagoon-shaped swimming pool. Recently refurbished, the 38-square meter Deluxe Ocean View Rooms offer a bathroom with views out to the sea and a large shower room with both high pressure and rain shower facilities. Last but not least, the Royal Suites offer full views of the Andaman Sea and are 266 square meters, including the main balcony area of 126 square meters. The suites showcase one large and spacious living room, a dining area, a master bedroom with a well-appointed en-suite bathroom with separate shower room and bath, a private balcony, and living area. The second bedroom has its own balcony and full en-suite bathroom. The suites are decorated in a warm and luxurious Thai style. At Le Méridien Phuket Beach Resort we have a large range of both land and water-based leisure and sports activities for you to choose from. Warm up with a trip around the hotel on our exercise circuit. Once the pulse is racing, keep up the momentum with a quick game of tennis, squash, volleyball, or table tennis. For those who like a bit more excitement, our rock-climbing wall will challenge you. For golfers, we have just the spot to practice your swing, under the helpful eye of our golf pro at the driving range. If the sports you seek are a little less strenuous, we also offer darts, mini-golf, and bocce ball for your enjoyment, together with a number of board games available in the Similan Lounge. Just off the beach lies a world of activities and exploration. Now is the time to do those things that you promised yourself. Whether you're experienced or a beginner, we have the facilities to meet your needs. Learn to sail, windsurf, dive, or just go snorkelling off our beach. After a busy day of basking in the sun or challenging yourself to one of our many leisure activities, we recommend a rejuvenating spa treatment at our Le Spa. Many exotic spa treatments await spa lovers in one of the 10 private stylish teak wood massage rooms, with natural foliage and aromas all created for your restoration of mind and body. Come and experience our world of pure relaxation where luxury and pleasure blend to create a sanctuary of peace and tranquillity. Le Méridien Phuket Beach Resort features a wide range of cuisine options, with ten world-class restaurants and bars, each offering a unique and relaxing dining experience. From early morning and late night, the very finest Thai and international cuisines are served. Gastronomic delights are wonderfully prepared by professionally trained chefs – ranging from fresh seafood and Pacific Rim specialties to European favorites. Guests can even experience the distinct delight of Royal Thai cuisine.